On the other hand I believe that irreligion doesn’t get a fair go either. It’s the other side of the coin. Any criticism of religious propositions gets labeled as boorish. 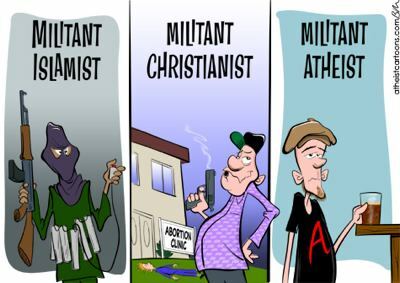 As militant. As fundamentalist. (You know what they say about labels. “They enable us to hate people without getting to know them”). The non-religious are often seen as having no rights in any such discussion. An example in New Zealand was the discussion around the National Statement on Religious Diversity (see Another chance to ignore our true religious diversity). Or our views are seen as somehow being unworthy of inclusion. This happened to me recently when I inquired about a meeting organised by a local Anglican minister. I had heard that the meeting was aimed at getting feedback from non-churchgoers. “What are we doing wrong?” sort of thing. My email inquiry received a brusque: “Not sure that it’s really what you think it is. The article can be reached by googling Waikato Times.” OK, not very friendly but let’s have a look. The Waikato Times article described the meeting as an attempt to re-connect with people who used to be church-goers, but for some reason stopped. “Maybe they felt religion was pushed too much at school. We want to hear from them, and also to apologise where necessary.” (see Come and preach to us, say churches). “Looking at this guy’s website I hope he doesn’t turn up. Have directed him to the Times article and told him I don’t think it’s what he thinks it is! OK – no they didn’t want feedback, just “lost souls.” But what a cheek? Any non-religious person attending the meeting was to be seen as pushing “their own agenda” and “trying to sabotage” the meeting! But it’s not only the religious protagonist who indulges in the demonisation, labeling and stereotyping of the non-religious. Some of the non-religious also do it. In his book Breaking the Spell: Religion as a Natural Phenomenon Daniel Dennett calls this problem “belief in belief”. The idea that religious beliefs have a special place and special protection. That they should be protected from criticism – not open to discussion and debate. And some of these people buy into the demonisation, labeling and stereotyping. We saw this recently with Michael Ruse‘s article Why I Think the New Atheists are a Bloody Disaster. He really doesn’t like Richard Dawkins, does he? I think there’s some professional jealousy there. This sort of response has often come from colleagues of those who do an effective job in science popularisation and dissemination. I was struck by how glibly Ruse slips into violent terminology when talking about the “new atheists.” He accuses them of being “aggressively pro-science” and “pro-Darwinism”. They are “violently anti-religion.” Believing scientist like Francis Collins incur “their wrath” and “their hatred.” They think “every kind of religious belief is wrong, pernicious, and socially and personally dangerous.” They are “excoriating” people. Notice the demonisation. Perhaps these “new atheists” are wrong in what they are saying. If so they should be engaged with and their mistakes pointed out. Demonisation with labels and stereotypes (and false accusations) is not engagement. It is an attempt to deny the irreligious a place in the public square. To deny them the right to make their points. And to deny them the ordinary respect of honest discussion. The same respect we accord to people discussing politics and sport. It is buying in to the Organisation of Islamic Countries propaganda that criticism of religion is “defamation” (see Attacks on freedom of expression go international). I think some critics of the “new atheists” see it as a matter of tactics. Ruse himself comments on the need to cuddle up to the religious. “We evolutionists have got to speak to these people. We have got to show them that Darwinism is their friend not their enemy. We have got to get them onside when it comes to science in the classroom.” Richard Dawkins partially concedes this point when he admits that he is not the best person to convince fundamentalist Christians they are wrong about evolution. He acknowledges that he would not have been the best witness for the plaintiffs ion the Dover Kitzmiller case (see Intelligent design/creationism III: The religious agenda). I don’t remember being turned away from science because the Head of the Chemistry Department at University was a Christian (I can still remember the biblical quotes he used to help explain organic chemistry. The Markovnikov rule for substitution – “From he that hath so shall it be given and he that hath not so shall it be taken away”). Nor did the fact that several of my bosses during my research career were Christian – and spoke publicly about their beliefs – turn me away. My interest would have been very false indeed if it had. No – Mooney and Kirshenbaum are using the “new atheists” as a scapegoat here. They should be looking at the more basic causes of opposition to science in America. But there is a place for different tactical approaches, and for people with different skills. The point is that they are not exclusive – as Ruse and others suggest. Dawkins will easily acknowledge the valuable role that believing scientists like Ken Miller and Francis Collins can and do play in the struggle against creationism. Ruse, himself, can perform well in this role. Maybe even Moody and Kirshenbaum have been able to raise awareness of the more extreme anti-science politicians in the USA. But does this mean that Dawkins and other great science popularisers should pull their heads in? Refuse to defend their own science and beliefs? Not critique the religious and political ideas of their colleagues whilst still respecting their scientific achievements and work in defending science? A little bit of thought will reveal that people like Richard Dawkins are extremely effective in their chosen role. With their chosen tactics. Go into any bookshop with a science section and see who is writing these books. Have a look at RichardDawkin.net and peruse the interesting content. Search for the videos of his lectures and appreciate the huge crowds he and similar people draw. Sure, this might upset some religious people and their fellow-travelers who “believe in belief.” But that is only because they interpret honest criticism and discussion as “defamation.” They prefer to stand back, demonise, label and stereotype, rather than honestly engaging with the criticism and discussion. And haven’t religious spokespersons been offending the irreligious for years with their anti-atheist ravings? For many non-believers people like Dawkins have been an inspiration. We are grateful that some people, at last, are prepared to stand up for their beliefs. Now that may not be winning over many believers and creationists. But it is valuable, nevertheless. Unless you think that non-believers have no rights! Perhaps we need a bit more respect amongst the non-believers, as well as between the religious and non-religious. If people like Ruse, Mooney and Kirshenbaum are being effective in winning over believers and creationists to a pro-science stance we should applaud them. But just ask that in the process they don’t scapegoat their scientific colleagues, who are at least as effective even though their audience may be slightly different. And perhaps we should applaud those who are effective in writing and lecturing about science and atheism. Who are drawing more and more people in to a fascination with science. And helping more and more of the irreligious to respect their own beliefs and ask that others do too. Tactics? I think we need both approaches. I am thankful for people like Ken Miller, Lawrence Krauss and Michael Shermer. But I am also very grateful for people like Richard Dawkins. This entry was posted in agnostic, agnosticism, atheism, belief, culture, diversity, faith, human rights, New Zealand, religion and tagged Anglicanism, Daniel Dennett, Francis Collins, Ireland, Islam, Ken Miller, Lawrence Krauss, Michael Ruse, Michael Shermer, National Statement on Religious Diversity, New Zealand, religion, Religion and Spirituality, Religious belief, Richard Dawkins, United Nations. Bookmark the permalink. Ken, I doubt you’ll agree with my starting point and expect you to disagree with my conclusion–but I’d like to answer your post with a sincere (albeit arguably nonsensical) response. I find it useful to think of the entire human race as a single interconnected “neural net,” composing a single phase space with approximately 60,000,000,000,000,000,000,000 dimensions (one for each human neuron in six billion brains). This phase space includes what I call “active regions,” a very generic term for “things people talk about. ” “Active regions” include trivial things like “banana,” imaginary things like “unicorns,” and profound things like “justice.” For purposes of “human cognitive space,” it makes no difference whether the “active region” involves something “real” or not. Thus, “God” is an “active region” in human conceptual space, whether God exists or not. I find myself agreeing with a number of your points, because the things you dislike (blasphemy laws, defamation of religion laws, etc.) appear to me to interfere with the processing power of this vast neural network. On the other hand, I also think the “new atheism” (and old fundamentalism) also reduce the processing power of this network. It’s easy to divide one neural net into two non-communicating regions, but you reduce the “intelligence” of the net when you do so. Cutting one “brain” into two pieces does NOT produce twice the intelligence. Let me end with a note of personal gratitude. In my opinion, “Open Parachute” is a forum which increases the intelligence of the overall system. You’ve made it possible for my the neurons of a lawyer in the United States to link up with scientists in New Zealand. Thank you for keeping this forum open! Scott, before you get slammed by the perpetual slammers, I just want to say that I like you and that I respect your attempts to get to the truth of things. I think the ‘neural net’ analogy is quite a nice one too. I personally see what you call ‘new atheism’ as part response to the utter inanity of Christian creationism and part cultural seismic activity (especially in the US where Christianity has such heavy influence). I don’t like the ‘them-vs-us’ mentality I see from time to time among atheists but I guess it’s inevitable among any group of humans (or other animals for that matter). It’s also inevitable that the people at the poles are going to attract more attention in public forums like blogs but it doesn’t necessarily represent the majority opinion. I’d like to see people who happen to be atheists be more constructive and genuinely believe the world would be a better place if we based our lives on reason rather than divine revelation or dogma. Ken, if there is a God then it seems that He intentionally causes His followers to let slip wedge strategies, accidentally type ‘cdesign proponentists’ and hit ‘reply’ instead of ‘forward’. Or at least at a higher rate than among the population of non-followers. If there isn’t a God then one has to wonder whether this gross incompetence indicates the tip of a very deep and deceptive iceberg. Scott – you seem to me, in essence, to be referring to the old “them vs us” intuition our species has and how this does restrict our intelligence. But use of labels like “new atheists” is actually part of the problem (demonisation) – and it’s not the atheists who use that term. Different beliefs, cultures and attitudes are inevitable. We should start by respecting the rights of people to have these (I know – a more sophisticated analysis requires us to confront the fact that some of these cultures and beliefs violate the rights of others). Now, I am not in any way denying the fact that the irreligious are also prone to “them and us” attitudes and demonisation. But currently there seems to be a common attitude that the irreligious don’t have a right to participate in the public square by presenting their own arguments – and feeling proud of their own beliefs. Why shouldn’t people like Francis Collins be criticised for claims he makes about scientific validation of religious belief, or inadequate basis for science in atheism? Why should this be interpreted as him being criticised for being a Christian? Or that he be denied his recent appointment because he is a Christian? Those claims are just outright wrong – and avoid the real issues. Sometimes there is an overall gain by first removing poorly functioning part of the net (an initial negative, or loss), with the intention of replacing the poorly function part later. Looking at it only in the short-term, during the “removal”/suppression of the poorly functioning part, would be misleading. Regards “new atheists” tactics as “bad”, I think that there is one right way to do this. With that in mind I feel all of the various criticisms of the various approaches all fail, basically because they don’t first start by looking at the many different prospective target audiences and measure them against that. Instead people make wide-sweeping remarks, which aren’t useful because there really is no one target audience, but a large collection of different groups, who each will respond to different things in different ways. By way of example one group that never seems to get mentioned are mild agnostics/atheists who have a rather naïve idea of what “stronger” religions are like (e.g. your average Joe Blog, who doesn’t really give religion much thought but considers it fairly innocent and supposes that “it keeps some people happy”). I suspect that the “new atheists” make these people quite a bit more aware than they were. I’ve been pondering Ken’s thesis for more than a day now, and I see some parallels between the atheist’s complaint and a similar problem that faces religious believers. People in advanced 21st century democracies are allowed to “share” their own religious beliefs, no matter how absurd they may seem to others. The stock response is something like, “I’m glad that works for you” or “There are many paths to truth.” Western society has pretty much caught up to ancient Rome, where the masses thought all religions were equally true, the elites thought all religions were equally false, and the government thought all religions were equally useful. A religious believer who isn’t content with saying “Here’s what I believe” gets into trouble when he says “Here’s why what you believe is wrong.” (I could document this in great detail if anybody needs evidence.) Such behavior is branded “intolerant,” “bigoted,” etc., and actually violates the “free speech codes” of some American universities. Pondering this a bit more after reading the “National Statement on Religious Diversity.” I get cold chills when I read phrases like, “The right to freedom of expression and freedom of the media are vital for democracy but should be exercised with responsibility.” What the government defines as “responsibility” can look a lot like “censorship” to the person who is accused of being “irresponsible speech.” This is a common problem with the “speech codes” that are becoming ever-more popular on American campuses. In America, people seem to think it is “irresponsible” to criticize the beliefs of people who tend to break out into violence, but it is not “irresponsible” to criticize the beliefs of more peaceable folk. 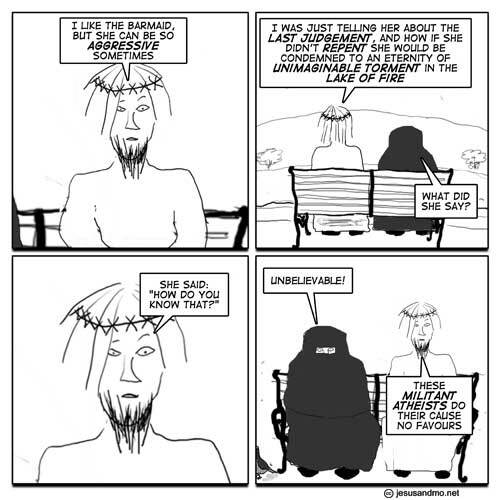 In practice, that means that “blasphemy laws” apply to people who make cartoons of Mohammad, but not to people who show Jesus talking about His barmaid. Scott – the National Statement was not a government statement. It was an “interfaith” statement. It actually contradicts our human rights legislation. That’s good to hear. Got a link to your bill of rights? You got a keyboard, fingers, and google? Scott – offhand I have this link (http://www.servat.unibe.ch/law/icl/nz01000_.html). But otherwise search for yourself. Is there anything in the Bill of Rights that you’d like to change, or is this pretty much what you’d choose if you were setting the standard? I don’t think its a matter of changing it – rather defending it. I think the ICCPR is pretty good – but it is under attack internationally, and in individual countries. In NZ the interfaith statement, for example, only sees the protection of safety as applying to “faith communities.” Charity for tax exemption purposes included religion, propagation of supernatural teachings, etc. Humanists are excluded. There is a similar confusion about “religious education” in schools. Despiute having good human rights legislation when it comes to specific issues like these our governing parties have been unwilling to change other legislation to bring it into line. Usually the answer is to take your own legal actions and establish your rights through case law. Not easy to to for the ordinary person. But, why do you ask? What is the significance of the quotes clauses to you? I’m sorry you had that experience with the church you emailed Ken, as you said, we shouldn’t label or stereotype so I hope you don’t think all Christians or all Churches hope, on reading your website, that you don’t turn up. Not all Christians are like the people you emailed. You’d be most welcome to turn up to Thinking Matters, to attend my church and come to my place for a meal – I’m sure we’d have some interesting conversation. I have probably read more of your website than the people you emailed and I do not share their attitude. Scott, here is the New Zealand Bill of Rights Act. Just note it is not a constitutional document, it is simply a piece of legislation that at times operates in subordination to other legislation – see esp ss 4, 5 and 6. The coercion test is dominant in NZ though we have some case law which moderates it, we have not gone as far as some US cases where the non-religious who feel left out for opting out are viewed as coerced, though we are heading that way – the National Statement on Religious Diversity is just one attempt – hence my research topic.